The triplets are crawling and sitting up, so we did their six-month photos to celebrate those milestones. This has always been my favorite age in babies, since it is when personality really starts to emerge. 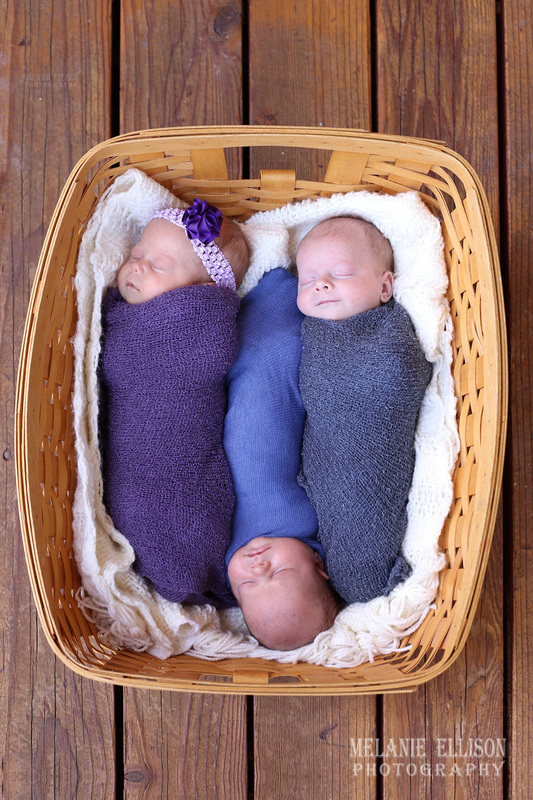 If you missed the triplets' newborn photos, you can look there first to see how much they've grown! Full disclosure--the babies were actually seven months old for this photoshoot (six months was based on their adjusted age since they were born a month early. As we did their newborn photos at one month, we have done their six month photos at seven months so they would be developmentally ready). Can't believe how much the babies have grown since they were in this very same basket as newborns! Now if you really want to see a behind the scenes pull-back, here's what we were working with half the time! Special thanks to all the lovely ladies who helped out. And thanks to the babies who forgave me for putting them in such absurd situations ;). Now for their individual portraits. Farmer in the making, anyone? As the biggest of the triplets, I have nicknamed Ryker "Chunk." Darlin' Katie is positively perfect in every way. There's a story behind this blue dress. Katie's great grandmother made it for Katie's grandmother. Her mother, aunt, and sister Addie all wore it too, so this is a very special dress, carefully preserved over the generations. I wonder if any of the preceding babies had such blue eyes that went with it though. Oh Charlie, you dazzle my heart with your bright, intelligent eyes! You're going to be a book worm, I just know it. I mean, look at those eyes! These sisters have a special bond. Baby Katie tunes in any time Addie starts talking to her. Kristi, I know you dislike platitudes, but you really have triumphed at this motherhood thing! Exclusively breastfeeding triplets for seven months and counting is an accomplishment that deserves sincere congratulations! Through all odds you have put your babies' wellbeing first by giving them the very best possible start to life anyone could have. I'm so proud of you as your doula, and inspired by you as your friend. God has blessed you with the armful of children that you dreamed of. I just wanted to say what a blessing it has been to have Melanie along for all the milestones! She is simply one of the most amazing women I have met. Our family loves her dearly.